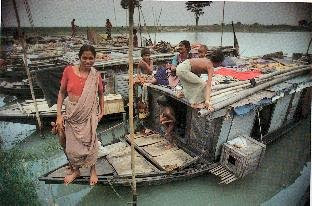 Bangladesh is virtually all river delta. The Bramaputra and its hundreds of tributaries and distributaries cover the entire western half of the country, while the eastern half is equally spiderveined by a large number of smaller rivers. During monsoon season, boats are the only practical way to get around large parts of the country, and so called "country boats" of a huge variety of types are pervasive throughout the country, coloring many aspects of culture, especially in rural areas. 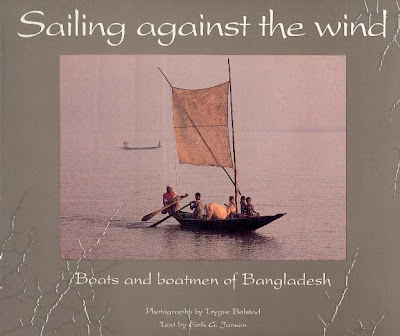 Sailing Against the Wind: Boats and Boatmen of Bangladesh, a book of (primarily) photos by Trygve Bolstad, with a few short chapters by Eirik A. Jansen, was published in 1992. At that time, Jansen noted the rapid replacement of many of the traditional types with motorized versions of just a couple types that leant themselves well to such conversion. I don't know the extent to which this transformation has continued since then, but it seems a safe guess that it did indeed continue, and that several types may have fallen out of favor, if not out of use altogether. 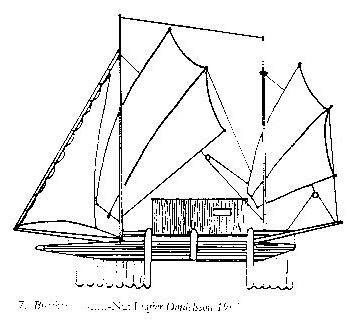 Most country boats are built shell-style -- that is, the hull planks were assembled to each other, and any inner structure, typically minimal in nature, was added later. 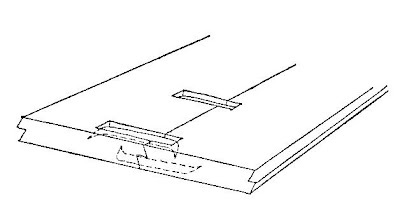 As shown in the sketch below, plank edges were commonly ship-lapped, and edge fastened with iron staples set into recesses on both the interior and exterior surfaces. The book doesn't give much additional detail on construction, and very little at all about the numerous boat types. What it does provide are dozens of wonderful, wonderful photographs, some of which I've including here. 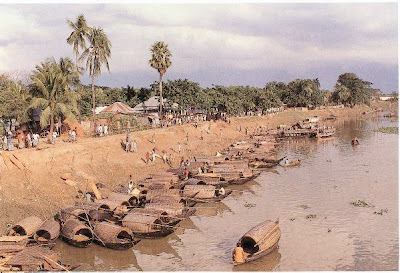 Ekmalaia boats at Jhitka market, Manilgganj. 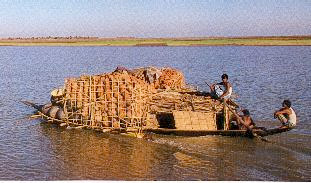 Swaronga boat carrying pottery on the river Kusiyara. 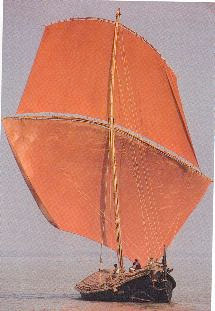 Malar boat on the Ganges. A fleet of gypsy boats, Mirpur. The book's caption reads, "These gypsies live on the boats their whole life." The Maine Canoe Symposium is one of my favorite things. Lots of good people, good food, good information and lots of fun. This year's is scheduled June 5-7, and the Peake brothers and Reinhard Zollitsch are featured speakers. It's at Camp Winona, Bridgton, Maine. For details, go here. 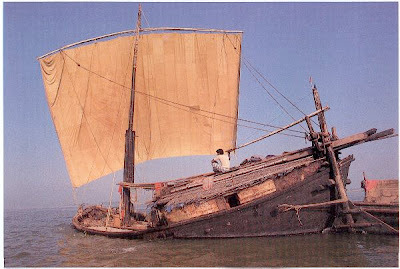 Everyone's heard of Kon Tiki, the balsa raft and the eponymous book by raftconteur Thor Heyerdahl. 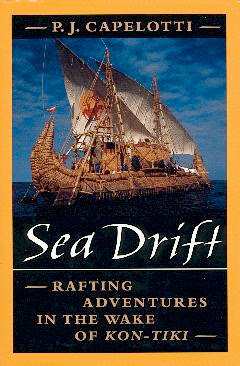 And a few of us are aware of some of Heyerdahl's other rafting adventures, especially on the reed boats Ra and Tigris. But who knew that Heyerdahl had inspired literally dozens of other raft trips by other quasi-scientists, dreamers, solitaries and assorted wackos? In Sea Drift, author P.J. Capelotti recounts more than 40 rafting expeditions since 1947, when Heyerdahl sailed and drifted in Kon Tiki across a good chunk of the Pacific Ocean. He does this briefly in most cases, since there's only so much detail you can fit into an under-300 page book that attempts to cover so many different stories. But what comes out is the notion that transoceanic rafting has a strange allure to certain strange individuals, and that there are a surprising number of them who have, or can scare up, the resources to act on it. I almost said "to turn their dreams into reality," but stopped myself, because that would be highly inaccurate, since a large majority of the rafting expeditions were miserable failures by almost any yardstick. Certainly, few of them succeeded in achieving their geographic targets, whether those targets were highly specific islands, or more generalized goals like "across the whole damn ocean" (or, in one case, a world circumnavigation! Don't make me laugh.). In fact, a good number of these would-be ocean crossers never got more than a few miles off their coast of departure. Some were simply unable to cross contrary currents or work against contrary winds. Others were poorly built from the get-go and began to fall apart almost immediately. That's not to say that there weren't some fairly impressive adventures -- but still, they never really proved anything. Most of them sought to demonstrate that some People could have settled some land by means of rafts. But that's a big so what? I could have written The DaVinci Code. It gets one not a bit further in discovering whether they actually did, or how. Capelotti has a certain amount of sympathy for many of his subjects, and a great deal of (probably undeserved) respect for Heyerdahl, who has been credibly accused to making up huge chunks of the so-called science upon which he based his transoceanic settlement theories. (I recall reading an article titled "Con Tiki.") And it is interesting, from sociological and nautical points of view, to read these brief descriptions of these oddball adventures. The book includes fairly crude sketches of many of the rafts, and just a single photo (of Heyerdahl, naturally). Of greater use are a couple of tables in appendices that list every post-WWII oceanic raft trip, their leaders, dates, basic construction materials (e.g., balsa, reed, plywood), geographic goals, results, and present disposition of the raft The book appears to be out of print (I found it deeply discounted in a local bookstore), but it's fairly recent (2001, Rutgers University Press), and I suspect it could be had if one looked hard enough.